Festive Overture, opus 96; Symphony No. 1 in F minor, opus 10; Symphony No. 6 in B minor, opus 54. 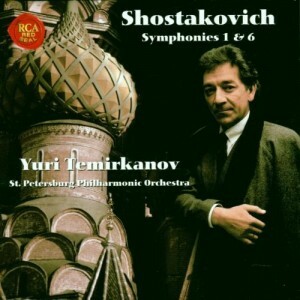 Yuri Temirkanov, St. Petersburg Philharmonic Orchestra. RCA Victor Red Seal 09026-68844-2. DDD. TT 64:54. Recorded Large Hall of St. Petersburg Philharmonic, 3 & 4 January 1996. Shostakovich’s 1st Symphony is often regarded as the academic exercise of a budding composer, modelled in its first half after the Russian symphonic tradition while the latter half represented the composer developing his own voice. Critics tend to view the work as Shostakovich’s only pure symphony as opposed to the “public” works of his career proper. This new reading by Yuri Temirkanov smashes all these preconceptions. Temirkanov blows away all the cobwebs of intellectualism normally associated with this work, putting it in proper perspective as an intrinsic part of the composer’s mature symphonic cycle. In the hands of Maestro Temirkanov, each movement unfolds as a series of dramatic tableaux, each revealing Shostakovich’s dark programme bit by bit until in the Finale the great timpani strokes sound like warning alarms of a dark future ahead. Premonition or foresight? 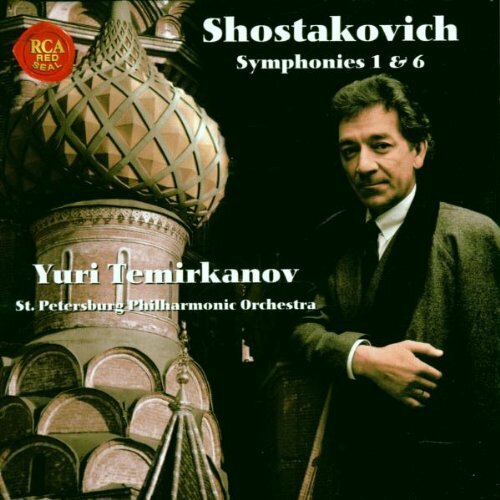 The way Temirkanov unfolds the tale within this enigmatic work, with its highly theatrical sequences and an orchestration that at times approaches the brutality of the 4th Symphony, seems to suggest both. The solo instruments delight in their part like cast-members of a stage play, the piano leaping forth in the Scherzo to its Petrushkian battle against the orchestra, all suggesting that the choice of instruments had more to do with storytelling than with sound colour. Careful balancing and a superb engineering help tremendously to put all these elements into perspective within the huge orchestral tuttis. With all the diabolical goings-on put to a halt by the knell of those thick piano chords (which might have benefited from more weight) the expansive Lento seems less of a new chapter (as described by some commentators) than a continuation of previous events. The oboe solo takes on the desolate cries of its cor anglais counterpart in the 8th Symphony, and the ensuing funeral march is vividly characterised. In a clever stroke, the dying phrases of this movement suddenly intone a transposition of the DSCH motif (on B), with the violins discreetly pitching in the “S” in the main theme. Temirkanov tells us that Shostakovich once expressed the desire to excise the famous snare-drum bridge. Here the maestro fulfils Shostakovich’s wish, lending an air of sobriety and foreboding to the Finale, which is a brutal and fearsome rush into an uncertain future. The final bars are especially bracing, with the snarling brass chords and thundering percussion bringing this work to a thrilling climax. The 6th Symphony picks up where the cataclysmic end of the 1st leaves off, and Temirkanov dispels any notion that this was the work of a composer in despair. His Largo is tough and unsentimental, although it is not as frigid as the opening bars suggest. After what is a tight-lipped admission of sorrow, Temirkanov slowly relaxes his hold on the initial eulogies to begin searching for some light in the deep freeze of the inner bars, exercising wonderful flexibility with the score. It is a chilling reading, so that when the horns over the trilling celesta finally herald the icy break of dawn, one can actually sense the fleeting glimpse of hope. The Allegro is as mean as Mravinsky’s, only the St Petersburg players are now as agile as a band of sword-wielding ninjas, flipping and twirling through what is essentially a brutal mockery of the “optimistic” music expected of the composer. With this sort of precision the orchestra manoeuvres the restlessly running lines with unparalleled irreverence. Again, the superb balance in this recording helps to illuminate the many details of the score, notably the important contributions of the bass clarinet, who in this movement engages the flute in a hilarious recapitulation of the main theme only to have the latter run off in the opposite direction. The Presto piles on the momentum after a fleeting opening where the orchestra, demonstrating its incredible agility, starts off almost inaudibly. 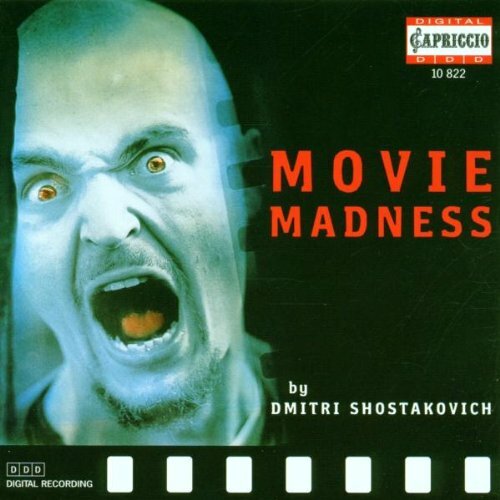 Again such dramatic treatment brings out the theatrical aspects of Shostakovich’s scores, in this movement especially where the burlesque builds into a grimacing climax before dissolving into a series of solo sequences. And as with the 1st Symphony, the final bars snarl with defiance, with the timpani and bass drum pounding into the listener that this is no ordinary circus act. The engineering is remarkably clear and transparent, a huge improvement over the sadly subdued sound of Temirkanov’s previous Shostakovich 7th on RCA. Unlike many modern recordings, the solo lines are as clearly audible as the loud climaxes, yet the entire sonic range remains breathtaking. This vintage orchestra sounds even more remarkable now than it ever did, and what it has gained in precision and razor-sharp execution has not been at the expense of its raw, electrifying timbre. The rich human-like voice of its famous string section is happily still one of the most memorable aspects of this ensemble. Maestro Temirkanov handles these forces with a masterful command. The choice of the Festive Overture as curtain raiser is a little odd though, something more suited to a concert programme. The Overture, if a little rushed, nevertheless provides a brilliant warm-up to one of the most thrilling new recordings of these two symphonies in recent years. It is certainly one of the best in Temirkanov’s RCA cycle. Symphony No. 6 in B minor, opus 54[a]; The Golden Age concert suite, opus 22a[b]; Katerina Izmaylova Entr’acte music from opus 114[c]. 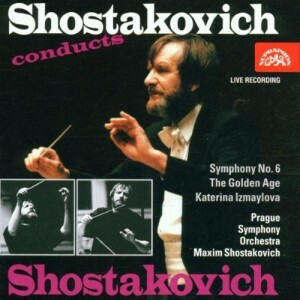 Maxim Shostakovich, Prague Symphony Orchestra. Supraphon SU 3415-2 031. DDD. TT 66:01. Recorded live Dvorák Hall, Rudolfinum, Prague, 14 November 1996[a,c]; Smetana Hall, Municipal House, Prague, 2 March 1999[b]. Maxim has had varying levels of success with his recordings of his father’s symphonies. His Collins sessions were unimpressive. His recent efforts under Supraphon, however, are beginning to do justice to the family name. His live recording of Babi Yar (SU 0160-2-231) was a splendid effort that puts him up amongst the better interpretations of the nineties. This new release sees him continuing to produce electrifying accounts that will put him in contention with all existing favourites. Amongst these, the Mravinsky on BMG (74321-25198-2) dogged by infamous Soviet engineering (the notorious boosting of selected instruments that suddenly leap in your face, like that bass clarinet) is still one of the best interpretations, with Ashkenazy’s tough and angry account on Decca (425 609-2) providing the modern-day equivalent and Järvi on Chandos (CHAN 8411) giving stiff competition with sumptuous sound and deep insights. Maxim’s Sixth takes all these into account, and presents a reading that is satisfying in most aspects. This is a live recording, and this is perhaps where the junior Shostakovich excels. His Largo is more anguished and expansive than Temirkanov’s, and his conception of this movement is starkly different. Maxim takes his time with the declamations, and they carry the weight of huge suffering tempered with a great dignity. At 18:51 minutes (as compared to Temirkanov’s 15:40 and Mravinsky’s 16:02) the events of this movement unfold like a procession of mourners. It is irredeemably bleak, even that brief ray of sunshine (the horn chords, taken by Maxim as something altogether more sombre and pained) fails to permeate its darkness. The only problem with this approach is that he overlooks the dramatic aspects of the Largo, and the moment of relief provided by that watershed horn-celesta passage never arrives. Temirkanov on the other hand judges it perfectly, allowing the remainder of the Largo to wind-up like an epilogue, the strange recapitulation that under Maxim’s direction becomes a seamless part of the mourning that from start to finish never relents. Maxim’s Scherzo matches his rivals in its bitter irony and grimacing optimism, although it is less driven than all the alternatives mentioned. This has the effect of highlighting the sarcasm of the big central climax with the battering percussion and splashing gong, which is glorious, whereas in the quiet coda the buffoonery is inescapable. This sets the stage for a spirited Presto, which may start a little innocently but which turns absolutely murderous in the climax, with the snare drum making a startling contribution. The closing conveys all the electricity of a live recording, and whatever misgivings one used to have about Maxim’s ability to flesh out his Shostakovich are once and for all squashed. The same sort of angry edge and brilliant characterisation makes for a marvellous performance of The Golden Age Suite, which sheds its propagandist pretensions to reveal the brimming contempt contained within the music. The Adagio is particularly outstanding as the prototype of Shostakovich’s slow movements, and has a truly memorable clarinet solo. The Prague Symphony truly relishes this score and makes a far stronger case for this work than Rozhdestvensky does with his complete recording on Chandos (CHAN 9251). The Entr’acte Music from Katerina Izmaylova is truly one of the highlights of this recording, considering the rarity of recordings devoted to the Suite and practically none of the complete opera. The First Entr’acte is thrilling, and overall one gets a feel of the more sombre colours Shostakovich put into his revision. The youthful garishness of the original Lady Macbeth has been softened to heighten the tragic elements over the satirical, for example the significantly reworked first Presto (Interlude between Scenes 7 and 8), which transforms the more irreverent original into something closer to the Scherzo of the 10th Symphony. The Largo is earth-shattering in a hopelessness that approaches the most terrifying moments of the 4th Symphony, but which at its heart is still palpably humane. These five entr’actes make a strong case for the complete opera, in either guise, as a true masterpiece. The recording, although possessing less sparkle than Temirkanov’s, is rather appropriate for the darker mood of Maxim’s overall programme and every detail is captured with excellent fidelity. Both are excellent releases, each offering a different view of the 6th. Temirkanov in the end has the upper hand: he takes more risks and reaps the rewards with a terrifying account served by a crisp ensemble that makes the Prague orchestra sound just a little shabby in comparison. Maxim plays it safer, but the end result is still pretty impressive. In the end it is a question of taste. I am deeply indebted to having experienced both performances. Symphony No. 5 in D minor, opus 47[a]; Symphony No. 6 in B minor, opus 54[b]; Symphony No. 10 in E minor, opus 93[c]. Mark Wigglesworth, BBC National Orchestra of Wales. BIS CD-973/974. 2 disc set. DDD. TT 76:38 + 63:31. Recorded Brangwyn Hall, Swansea, Wales, December 1996[a]; November 1997[b,c]. 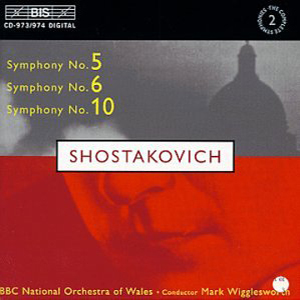 The first reaction I had to this release was negative: why programme this second entry in Wigglesworth’s Shostakovich intégrale such that a symphony (the Fifth) needs to be split over two CDs? That quibble is squelched by the privilege of having the booklet notes penned by the conductor, as he’d done so capably for Symphony No. 7 (reviewed in DSCH 10). Wigglesworth has clearly read the relevant literature, and although DSCH readers will be familiar with the politico-historical details he sets forth, it is a rare and valuable thing indeed to be able to read how those details affect the conductor’s conception of what the music is all about and how it should be performed. Another, less felicitous aspect of the Wigglesworth sound is the insertion of string portamenti that are not indicated in the score at various points in the Largo. These note slides sound weepy and melodramatic, out of character with the seriousness of the rest of the proceedings. Their purpose is unclear, but Wigglesworth seems attached to them, as they were liberally deployed throughout his earlier release of the Seventh Symphony, as well as in all three symphonies here. Their use in the Sixth hearkens back to outmoded Western performing practice, as can be heard in Fritz Reiner’s mono Sixth of 1945, which is itself a deeply-felt reading in which these mannerisms seem less out-of-place (Sony Classical MHK 62343). I would be remiss were I not to comment on the recorded sound for this symphony. BIS have provided a very wide dynamic range, such that the opening section of the first movement is quite inaudible at normal volume settings, and the whole sounds flat and recessed unless you turn the knob to regions of the scale it would never normally visit. Then, of course, tutti are liable to get you evicted. For the brave, this makes for a bracing experience, but those with low amplifier wattage or poorly sound-insulated listening environments should proceed with caution. I’ve listened to these recordings well over a dozen times each, and find new items of interest on each hearing. That’s not to say that I’ve fallen for them, or that I think they light the path for future performances, but Wigglesworth has something meaningful to say in this repertoire, he succeeds in getting it across, and you’d be depriving yourself of a challenging experience if you neglected his voice. Vaughan Williams was heard to say of his own Fourth Symphony, “I don’t know if I like it, but it’s what I meant.” Well, these performances are what Wigglesworth meant. I leave it to the individual listener to decide if they are what Shostakovich meant too. Symphony No. 5 in D minor, opus 47[a]; Concerto for Cello and Orchestra No. 1 in Eb major, opus 107[b]. 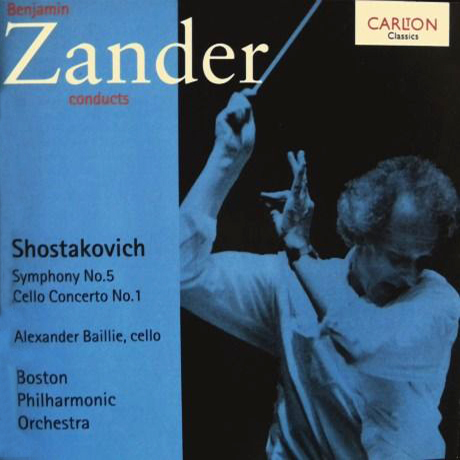 Benjamin Zander, Boston Philharmonic Orchestra, Alexander Baillie (cello)[b]. Carlton Classics 30366 01012. DDD. TT 79:17. Recorded Jordan Hall, Boston, 11 September 1994[a]; live, Sanders Theatre, Cambridge MA, 2 May 1993[b]. British-born, Boston-based conductor Benjamin Zander’s contribution to the booklet notes is a fine example of his campaign to expand the audience for serious music. In little more than a page he provides a description of the Fifth Symphony’s political surroundings and how the tempo of its conclusion relates to them, in terms that will be readily understood by even the most naïve reader, yet bearing no hint of condescension. Furthermore, were I to choose a programme to introduce a new listener to Shostakovich’s music, this would be it: two of the composer’s most accessible, and most consistently-rewarding works. This would not, however, be my recommendation as to recordings. The field in this repertoire is competitive in the extreme, and notwithstanding the Boston Philharmonic’s evident commitment, the fact remains that they are a semi-professional orchestra. Performances of both works are afflicted by tentativeness, imprecisions in pitch and ensemble, and sometimes wobbly brass intonation. As an interpretation, though, Zander’s reading of the symphony is refreshingly conventional (sic! ), with engaging flow and genuine drama. Given a superior orchestra, it would have made a good starting point for uninitiated listeners. Indeed, even with the performance’s imperfections, I could not help but be caught up in its enthusiasm. I enjoyed the cello concerto coupling rather less. Cellist Alexander Baillie puts in a good showing, deserving special praise for a penetrating Moderato, but this live recording does not do justice to any of the players, littered as it is with coughs and fidgetting, and almost Soviet-era acoustics. Orchestral support is only adequate, and others will likely be as irritated as I was by the rattly contrabassoon. Obviously too, the live recording mercilessly preserves on disc the usual slip-ups that one would tend to overlook as a member of the concert audience – or even as a home listener were the performance of greater stature. I do want to applaud Carlton for a very generous programme, almost six minutes longer than the CD Red Book envisaged, and for compiling informative and well-written booklet notes from the conductor, Gerard McBurney (cited as “Gerald”), and David St. George. Suite for Variety Orchestra [misidentified as Suite for Jazz Orchestra No. 2], extracts[a]; Dance[b]; Spanish Dance[c]; The Young Lady and the Hooligan, extracts[d]; Child’s Notebook, opus 69, extracts[e]; Ballet Suite No. 1[f]. Arnold Katz, Novosibirsk Philharmonic Orchestra[a]; Rimma Bobritskaya (piano)[b,c,e]; Mark Gorenstein, Symphonic Orchestra of Russia[d,f]. Recorded Novosibirsk Philharmonie, June 1997[a]; Moscow Conservatory, February 1991[b,c,e]; Mosfilm Studios, June 1994[d] and December 1996[f]. Includes previously released material. Saison Russe RUS 788164. DDD. TT 58:24. If you need one good reason to acquire this disc, it would be the cover photo. Saison Russe’s latest Shostakovich release features the composer in a rare moment of frivolity, a photo taken in 1943 at Ivanovo with Shostakovich posing with a couple of piglets. It would be tempting to read the artwork as a subtle poke in the direction of Animal Farm if it weren’t for the programme, which might best be summed up as a representative sampling of what critics call Shostakovich’s “bad music”. [Reviewer refers to cover art from original issue; currently available reissue has new cover, shown at left, but includes portion of original image on back.] This is Dance Hall Days Shostakovich, the sort of music that made him famous at home and infamous abroad and which probably saved his skin more than once. If at first go this programme seems a bit of an overkill, owing in no small part to the repetition of quite a few numbers, taken in small portions it can be loads of fun. 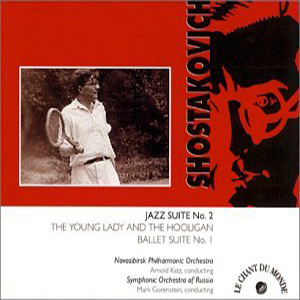 The Suite for Variety Orchestra (which is commonly mistaken for the lost 1938 Jazz Suite No. 2, as is the case in Saison Russe’s annotation) is more like tea-room entertainment composed for the sideshow orchestra, and consists of easy-listening waltzes and polkas. The opening Dance is none other than the Spanish Dance from The Gadfly, given a fireman-band treatment that borders on annoying, although the rest of the music is happily more laid back. “Jazz” instrumentation includes a seedy saxophone section and an accordion. The Young Lady and the Hooligan is basically a theatre revue comprising Shostakovich’s music from the 30s. Prime beef is Galop from The Limpid Stream, a truly banal piece of work that almost smacks of contempt, and the Dance of the Coachmen from The Bolt, famous for its trombone raspberries. 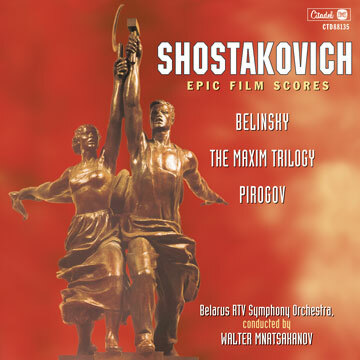 It might be a stroke of mischief that Shostakovich uses the latter to portray the hooligan, but generally these twenty-five minutes of highlights, including a snippet from the Cello Sonata, are pretty innocuous though quite entertaining. The Ballet Suite No. 1 is compiled again from The Limpid Stream, and probably represents as much of the ballet as one can stomach at one sitting. The Suite also includes an item from The Bolt that was never published, the Playful Waltz, and it is not hard to figure out why. There is a wonderful mixture of irreverence, wicked fun and even moments of deliberate crudeness in these scores, all served up with Shostakovich’s trademark sense of humour. Included are two piano arrangements of Dances from, again, The Limpid Stream and The Gadfly, as well as the charming diversion Child’s Notebook [excerpts only; read review of complete work in DSCH 11]. Mark Gorenstein delivers far more characterful accounts in the later tracks with the polished and responsive Symphonic Orchestra of Russia than Arnold Katz does with his somewhat stiff Novosibirsk forces on the Jazz Suite. Recordings Editor’s Note: The CD cover lists the programme with no mention that only excerpts, not the complete works, are supplied. Music from The Maxim Trilogy, Opp. 41(i), 45, 50; Belinsky, opus 85[a]; Pirogov, opus 76. Walter Mnatsakanov, Belarus RTV Symphony Orchestra, Belarus State Chorus. Citadel CTD 88135. DDD. TT 78:34. World première recording of suite[a]. In collaboration with Russian Disc, Citadel are giving us four volumes of Shostakovich film scores and this is the second, containing some of Shostakovich’s Socialist Realist scores. Cinematically speaking, these embrace one of his great popular successes and some of his worst political failures (though this had more to do with the films, all of which were directed by Grigori Kozintsev – and Leonid Trauberg in The Maxim Trilogy – than anything in Shostakovich’s music). The excerpts from The Maxim Trilogy (1935-9) as presented here are both more and less than they claim. More, in that the suite that was extracted by the faithful Atovmyan in 1961 includes a reworking of some of the music from the more recent The Unforgettable Year 1919 (1951), but less because there is no music from the third part, The Vyborg District (1939). The films follow a worker’s progress from learning about the Bolshevik cause in 1914 to becoming head of the National Bank directly under Lenin and Stalin, though the leader and teacher had a taste of his own medicine and was excised from prints reissued for the Lenin centenary in 1960. Shostakovich made little effort to reuse themes through the Trilogy, and this, coupled with the presence of two “foreign” pieces, deprives the suite of coherence, whatever the merits of the individual pieces. Confusingly, the suite starts with a Prelude reworked from The Unforgettable Year 1919. Michail Jurowski and the Berlin Radio Symphony Orchestra (Capriccio 10 561) add the Prologue that actually opens The Youth of Maxim (1935) score, but as it is not officially part of the suite Mnatsakanov omits it, sadly leaving us with the over-extended and less interesting of the two pieces. Cutting a verse would not come amiss. The Prologue is far more interesting, as Shostakovich demonstrates his contrapuntal skill by overlaying Oira Polka in the woodwind, the Karowiak in the brass and the folk song Black Eyes in the strings and trombone to accompany a night-time sleigh-ride. Later a soprano sings a few bars which bizarrely recount how she lost a football match. Doubtless Shostakovich’s love of the game had something to do with this. The nearest that the Prelude gets to that kind of wit is a close skirt by the Marseillaise, and its origins in the later Unforgettable Year 1919 are fairly clear compared to the rest of the suite. Attack Scene is a mere run-up to The Death of the Old Worker, where noble outbursts in the full orchestra alternate with solo cello laments in a way that almost seems to pre-echo the Fifteenth Symphony. Jurowski has the edge here with more involving soloists and harsher orchestral playing. Nevertheless, I prefer Citadel for the next track, where a quote from Tchaikovsky’s Yevgeny Onegin gives way to a charming, lightweight and witty Waltz that is the most Shostakovichian piece in the suite. Demonstration, a long sequence in the film, is rightly cut down for the suite – even with the visuals it goes on too long, and Fighting on the Barricades, with its echoes of the Prelude, again comes from Unforgettable Year 1919. In fact, being more symphonic, that suite is more satisfying that the Maxim one. The Funeral March and Finale follow on, but it’s the middle movements of the suite that form the best of this music. Next on the disc is something to take note of: the world première recording of the 32-minute suite from Belinsky, though Citadel fail to capitalise on this in their annotation. This bio-pic of the 19th-century liberal literary critic was released in 1953, having been held up for three years. Quite why is not clear, but it may simply have been to leave a gap between it and another film that was made on the same subject in 1948. If there were any political machinations involved, they later subsided to the point where Shostakovich felt able to arrange several of the songs for republication. Atovmyan’s suite appeared in 1960. It’s sad that the suite has had to wait this long for its first recording, as it contains some very enjoyable music. Shostakovich claimed to have based some of his work on folk songs from the 1840s collected by Feodosii Antonovich Rubtsov and there is a popular melodic strain to much of the music, though there are few actual quotes. The energetic Overture has some faint echoes of the Festive Overture and The Gadfly; indeed, if you enjoy that score, Belinsky should be very much to your taste. Sorrowful Song is one of Shostakovich’s longest single film cues, at just over eleven minutes, yet this choral lament doesn’t drag at all, as he alternates between orchestra and choir, changing the colours constantly. The Strength of the People is a more traditional choral song, supported by rushing figures in the orchestra, and is followed by a slower, darker Intermezzo whose orchestration is reminiscent of the 10th Symphony. Next comes a pastoral Song Without Words which builds to an orchestral climax before a quiet coda. The Scene reintroduces some of the Overture‘s material, but the violent reworking for full orchestra and choir doesn’t spike the gun of the Finale which follows straight on and which, though conventional in its mood of “noble struggle”, unusually ends morendo. Finally a slightly less rare score: Pirogov. Another bio-pic, this time telling about a surgeon famous for his work in the Crimean War, it was released in 1947. Shostakovich seems to be amusing himself by using clichés and parodies of the genre. Not surprisingly, given the wartime setting, the Introduction has plenty of militaristic fanfares and it’s followed by a Scene that is a galloping toccata, similar at times to the Eighth Symphony. The Waltz is a truly odd concoction with reminiscences of Shostakovich’s and others’ music in a piece that seems to change mood every few bars in a weirdly circussy way. The Scherzo swings the pendulum to the other extreme, and is so cinema-chase-like that it could almost be a parody, before the Finale brings things back to the middle way of conventionality. All in all, the disc is enjoyable, and for completists the presence of Belinsky makes it a must-have. Jurowski may be slightly preferable in The Maxim Trilogy, not only for including the Prologue but as a better performance, though the Belorussians are hardly slackers and their disc also has the advantage of having all the texts plus translations. The two rival complete Pirogovs (some individual movements have also been recorded) come from Jose Serebrier and Maxim Shostakovich (soon to be re-released on BMG) but Citadel’s disc can hold its head up to either of these performances, so if this programme appeals I wouldn’t wait. Extracts from Alone, opus 26; The Golden Mountains, opus 30; The Maxim Trilogy, Opp. 41(i), 45, 50; King Lear, opus 58a; Zoya, opus 64; The Fall of Berlin, opus 82; The Gadfly, opus 97; Five Days Five Nights, opus 111; Hamlet, opus 116. Michail Jurowski, James Judd, Leonid Grin (conductors), Svetlana Katchur (soprano), Vladimir Kazachuk (tenor), RIAS Chamber Choir, Berlin Radio Symphony Orchestra. Capriccio 10 822. DDD. TT 64:52. DSCH doesn’t usually review compilations of the Favourite Shostakovich variety, but this one is worth making an exception for if only because it allows a quick canter through some discs that were released before the journal ran regular reviews. Movie Madness is the title and (almost) all the tracks are from Capriccio’s series of Shostakovich film scores, hence the “Movie”. Quite where the “Madness” comes from (apart from an amusing alliterativeness and an alarming front cover photograph) I’m not sure. There are four tracks from The Gadfly, three from The Fall of Berlin, two each from The Maxim Trilogy and Hamlet and one each from Alone, The Golden Mountains, Zoya and Five Days Five Nights plus one other (of which more later). But no suite appears in full and the tracks have been shuffled so that no two consecutive ones are from the same film. I got the feeling that there was half an idea to produce a three-part “pseudo suite”: tracks 1 to 6, 7 to 10, and 11 to 16. The Prelude from The Fall of Berlin may not be Shostakovich’s greatest, but it is an effective if bombastic opener, and the mood is lightened by following it with the Folk Feast from The Gadfly before returning to The Fall of Berlin for In the Garden, a pleasant pastorale for chorus and orchestra. This is followed by the jokey Waltz from The Maxim Trilogy and the solemn Song of Cordelia, not from the film King Lear but from the wartime stage production (the original disc, Capriccio 10 397, has excerpts from both). Continuing the Shakespearean theme is the scurrying Ball at the Palace from Hamlet but the mood is rudely broken by the wonderfully exuberant Prologue from The Youth of Maxim, with a great contribution from Svetlana Chatter (sorry, Katchur) recounting her adventures as a football player but above all the cunning and witty interweaving of Oira Polka, the Karowiak and Black Eyes. 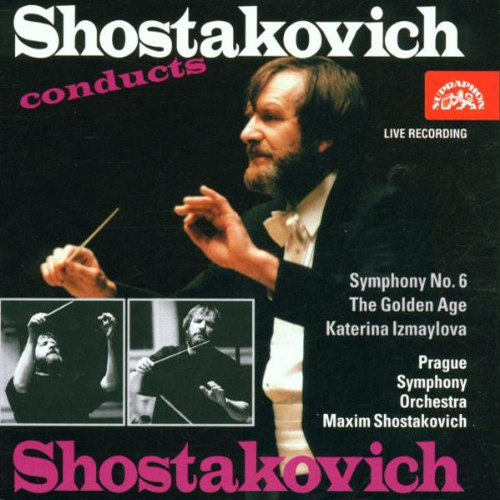 The light-hearted mood continues with the Waltz from The Golden Mountains and the Galop from The Gadfly; these three are amongst Shostakovich’s most enjoyable light pieces, and even if the March from Zoya has more than a hint of Tchaikovsky at his most overblown, it does bring this “scherzo” section of the disc to a neat and rousing close. The clash of styles between the next two tracks – The Gadfly‘s affectingly sentimental Introduction and the more free-wheelingly ironic Galop from Alone – is jarring; one definitely feels the 25 year gap. For the earlier film, Vladimir Kazachuk has but one line to repeatedly sing, “Kakaya khoroshaya budet zhizn” (“How Good Life Will Be”), but invests it with such feeling as is possible. Oddly, Alone and Hamlet in some ways seem closer despite the 34 year gap as, with In the Garden, Shostakovich recaptures some of his youthful lightness, working on his beloved text to produce an ironically coy contredanse. Liberated Dresden from Five Days Five Nights gives him a chance to interpolate a huge chunk of Beethoven’s Ninth Symphony, but however appropriate, I can’t help thinking it was also a time-saver on this, one of his weaker scores. The original double set (Capriccio 10 341/2) came with New Babylon and it’s frustrating that that score is unrepresented here. 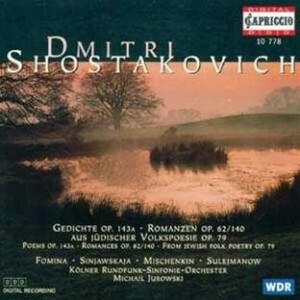 No disc of Shostakovich film-score highlights would be complete without the Romance from The Gadfly, and it duly turns up as a kind of intermezzo between the freeing of Dresden and The Fall of Berlin, or, to be more precise, The Storming of the Zeyelovsky Heights, which, though a disappointingly one-dimensional piece to end with, recalls some of the themes from the start of the disc, bringing it to a quasi-symphonic close. The whole of the Capriccio series has been enjoyably well-played and recorded; hopefully their work will continue, and perhaps even be spurred by the publication of several film scores in the forthcoming new Collected Works edition. As a sampler, this is a good disc showing many of Shostakovich’s sides (given the limitation to a single genre), though maybe a better approach would have been to group pieces from each score to make “mini-suites”. Ordered chronologically, this might have made a more illuminating introduction, though Uwe Kraemer’s primer-level notes – which only mention the film scores in the final paragraph – would have to be expanded. Even as they stand, they say nothing about any of the films represented. Having said that, this is a well-planned, played and recorded disc, and for anyone who only wants to dip a toe into Shostakovich’s film scores it’s particularly useful. Six Poems by Marina Tsvetayeva for alto and small orchestra, opus 143a[a]; Six Romances on verses by Walter Raleigh, Robert Burns and William Shakespeare for bass and small orchestra, opus 62/140[b]; From Jewish Folk Poetry for soprano, alto, tenor and orchestra, opus 79[c]. Michail Jurowski, Kölner Rundfunk-Sinfonie-Orchester, Nina Fomina (soprano), Tamara Sinjawskaja (alto), Arkadi Mischenkin (tenor), Stanislaw Sulejmanow (bass). Capriccio 10 778. DDD. TT 56:53. Recorded Studio Stolberger Straße, Köln, 17-19 June 1994[a,b]; Philharmonie, Köln, 22 & 27 May 1995[c]. Michail Jurowski has achieved some distinction as a Shostakovich interpreter over the past decade with his extensive survey of the film and theatre music on the Capriccio label. The series shows the conductor as a highly capable, sympathetic interpreter of the composer’s, with an appetite for the esoteric and a talent prepared for larger challenges. The current recording takes him in just those directions as he again enters the formidable arena of the composer’s orchestral song cycles. The disc under consideration features three works from this musically substantial repertoire, and is noteworthy for including the composer’s most undeservedly neglected cycle, the Six Poems of Marina Tsvetayeva. The remaining two works, the British Romances and From Jewish Folk Poetry, have received a number of recent recordings that were reviewed in these pages. In comparison to his earlier entries in the genre, Shostakovich brought a far more idiosyncratic musical language to the vocal cycles of the later years. This late blossoming style, with its dark insularity and subtle gesture, produced some of his best works in the genre. I have always considered the crowning peaks of this golden period of song writing to be the Blok Romances of 1967 and the Tsvetayeva Suite of 1973, both for their outstanding dramatic unity and profoundly inspired lyricism. While the former work has been recorded quite often, the relatively few recordings of the latter in the Western catalogue is astonishing. In fact, I have only been able to track down two other non-Melodiya recordings of the work in the digital era. It is not surprising that Shostakovich, especially in the antepenultimate year of his life, was drawn to Tsvetayeva’s deeply cynical, melancholic lyrics. As near contemporaries, both artists suffered under the same regime, her suicide on Russian soil in 1941 ending an all-too brief and neglected career. Their different creative paths were, nonetheless, united in exposing the hypocrisies of authority and its tyranny over artistic freedom. Shostakovich’s selection of six of her now bitter, now satirical lyrics is patently self-referential in centring on the vicissitudes of the creative life. Four poems offer a uniquely shared perspective on creativity: creativity under oppression, that unrecognized, and that falsely honoured. The suite includes a poem each on death and innocent love, and ends with Tsvetayeva’s tribute to the creativity of another Soviet artist, Anna Akhmatova. In these verses Shostakovich would find a dark pungency and uncommon strength of inspiration, deploying his gestural language to maximum expressive effect. The verses are treated with remarkable detail, the musical phrases tailored to each line with meticulous inflections of dynamics and mood. Morbidity, sarcasm, vacuous heraldry, solemn reflection, and agitation, are vividly interwoven into a magnificently conceived web of structural solidity combined with spontaneous passion. It is the kind of music that demands the utmost involvement on the part of its performers and that is exactly what it receives on the current recording. I was immediately impressed with the sense of unity and commitment that both conductor Jurowski and alto Tamara Sinjawskaja bring to the work. Ms. Sinjawskaja’s emotional involvement is the defining strength of her performance, one that must be accepted, unfortunately, with an occasional throatiness in her vocal tone that I did not find at all obtrusive. She rises to the volatile crescendi in the opening In My Poems, and negotiates the dramatic dynamic shifts in Hamlet’s Dialogue with much effect. She convincingly brings off the sarcasm veering on pain in the pompously declamatory Poet and Czar, and her sustained level of heightened expression in the final setting, Anna Akhmatova, is also moving. This is a performance that, to my ears, fares preferentially with the competitive recording with alto Elena Zaremba on Volume 2 (1995) of the complete song cycles with Neeme Järvi and the Gothenberg SO (DG 447 085-2). Ms. Zaremba may have the more polished vocal facility, yet the synergy between her and Järvi does not have the same grit and spontaneity as found between soloist and conductor on the current disc. The current performance of From Jewish Folk Poetry follows a number of fine performances that have appeared on CD recently. One in particular that has become a standard of performance excellence is the one by Järvi and cohorts on DG (439 860-2). Järvi’s soloists again have the more polished voices in a performance that is powerfully expressive and a degree or two more nuanced than the current one. However, the Jurowski reading has its own set of checkpoints that make it one with a memorable personality. The vocalists are quite good and in complete concert with Jurowski’s demonstrative gestures and detailed conception. If none of the vocalists are terribly distinctive, they are duly expressive as an ensemble of three and offer a committed performance that I have found satisfying on each listening. The Six Romances on English Poets have also had a number of recent recordings of merit. The warmth and ingratiating charm of its lyricism has made this the most frequently recorded orchestral cycle after From Jewish Folk Poetry, and it was one of the composer’s own favourites. Bass Stanislaw Sulejmanov adopts the appropriate operatic posture with these songs, whose colourful arioso passages offer the soloist a variety of dramatic opportunities. He breathes a fair amount of life into their now humorous, now pastoral, now meditative moods. Unfortunately, I was distracted here and there by Mr. Sulejmanov’s slightly unstable intonation, especially in the songs with more broadly drawn notes such as Shakespeare’s Sonnet 66, and conspicuously in the final held note of the last song, MacPherson’s Farewell. His dramatic presence earns him compensatory points, and he is admirably assisted by conductor Jurowski’s lively instrumental interpretation. The cumulative strength of this recording owes as much, if not more, to the vitality and interpretive flair of Jurowski’s baton as it does to the various vocalists. His fine Kölner instrumentalists have a strong ensemble sound with distinctive solos by fine individual players that do well with the close miking they receive. The sound engineering also provides excellent distribution and registration of individual instruments. The synergy of Jurowski’s superb take-charge interpretation combined with cooperative, if not the most polished, vocalists, and the well turned reading of the Tsvetayeva Suite, earn this release a definitive “well worth hearing” recommendation. Ten Choruses on Texts by Revolutionary Poets, opus 88, for four-voice a cappella chorus; Ten Russian Folk Songs, for soloists, mixed chorus and piano, Sans opus Q.
Viktor Popov (choirmaster), The Moscow Academy of Choral Singing, Tamara Kravtchenko (piano). Saison Russe RUS 288 160. DDD. TT 62:41. Recorded Small Hall, Moscow Conservatory, January-April 1998. Historically, the few choral works in the Shostakovich catalogue have received little recording attention. The current disc pairs two of these elusive rarities, both dating from 1951, and both curious by-products of the repressive post-War years. The time period and subject matter of these works surround them in the familiar political intrigue. On the surface, the composer seems to have gone out of his way to comply with the creative guidelines established by the Party’s 1948 Decree against formalism. Words and music rest on exceedingly safe grounds. Ten Choruses dwells on themes of the 1905 Revolution penned by turn of the century revolutionary poets, while Ten Russian Folk Songs consists of straightforward settings of exactly what its title describes. In their exceedingly conservative manner, they seem to supply just what the Great Leader and Teacher so forcefully demanded from his worthy musicians. We naturally wonder whether they can be taken at face value or whether, as with the From Jewish Folk Poetry cycle of the same period, the suggestion of subversion lies beneath their obliging surfaces. More likely, these works are a shrewd compromise between bureaucratic acceptability and a selection of material that was of genuine interest to the composer. Given the political climate, the theme of revolution in the opus 88 choruses acquires a resonance well beyond the particulars of the workers’ 1905 uprising. As in the Eleventh Symphony, written six years later and based on the same historical event, the theme of revolution assumes a universal symbol of the oppressed everywhere: prisoners of war, victims of tyranny, fellow artists and intellectuals, and poignantly, the composer himself. One cannot help but hear in them a personal declaration against the Zhdanov era, an expression of the composer’s own voice of protest joining the chorus of those before him who railed against the forces of tyranny. Aside from a few brief passages in his film scores, Ten Choruses represents the composer’s first attempt at a cappella writing. This fact may explain its dependence upon standard devices and textures, ones that almost obscure the composer’s familiar fingerprints. It also happens to be one of the very few works (his opera Katerina Izmaylova being another) that Shostakovich revised extensively after its composition, in this case in response to an appraisal of its first draft by his musical friends. At the same time, its retrofitted musical language seems deliberately tailored to the ethos and historic character of these turn-of-the century verses. The texts themselves have a gritty candour, a smoldering sense of immediacy that plunges the reader directly into the passion and fury of the times. The music may not be the most original or memorable written by the composer, but, if nothing else, it captures the mood, vitality and valour of these genuine, in-the-moment texts with the utmost reverence. This is evident from the robustness of the opening and closing march movements, Come, Comrades, Forge Ahead and the final, noble Song with its recognizably Shostakovian march steps. Of the entire set, the second, fourth and sixth choruses, in particular, stand out for their musical merits. The second chorus, One Among so Many, is a mournful elegy to a victim of the cause that has the benefit of a good leading theme and fluidly expressive contrapuntal accompaniment. Both lead the music, alternating between 6/8 and 9/8, to a number of finely delineated crescendi. The fourth chorus contains the love poem, Meeting During a Transfer, whose tender, touching moments are mediated by a throbbing accompaniment of three-note figures, again in alternating 6/8 and 9/8 time. Those familiar with the Eleventh Symphony will take note that both its principal motto theme and the main theme of its second movement have their origin in the sixth chorus, January 9th, an extended, multi-part setting whose variegated sections are poignantly atmospheric. Amidst these high points, one also finds movements that leave a rather neutral impression, such as the quick-paced third chorus, In the Streets!, which, for all its ready-made momentum, fails to generate much excitement. Another example is the sombre elegy entitled Last Salvos, number 7, which leaves surprisingly little impression. The presence of such colourless movements tends to weaken the overall impact of the work, whose finer moments, as implied, lie in its individual parts. As in his much later, and only other significant a cappella work, Loyalty (1970), the genre seems to compete with the composer’s natural inclination toward the instrumental and more horizontal plane of musical thinking. For the Shostakovich devotee, however, the work is still worth hearing on occasion as an earnest evocation of the turbulent stirrings of turn-of-the-century Russia and not least, for its ramifications on the composer’s own cloaked state of mind during the final years of the Stalin administration. Ten Russian Folksongs is a work altogether different in character and tone. Drawn from collections published in 1896, 1904, and 1943, and set for piano and chorus, they are wonderfully crafted, tunefully gratifying miniatures, if even less representative of the composer’s style than Ten Choruses. Half the settings are soldiers’ songs with prominent male solos, such as the hearty chest-pumping march, Clap of Thunder over Moscow that opens the set. Three songs featuring solo soprano have a truly haunting beauty: The Match, more especially Cuckoo’s Cry, and most especially one saved until just before the last, I Tell my Beloved, a tune that literally stops me in my tracks every time I hear it. One song with a particularly Shostakovian piano accompaniment is the infectiously bouncy march Out of a Forest of Lances and Swords. One imagines how the character of Russian folksong, these songs in particular, influenced the composer’s subsequent lyrical style. Though the works on this disc form a minor part of the composer’s catalogue, for the Shostakovich completist, they are nothing less than indispensable. 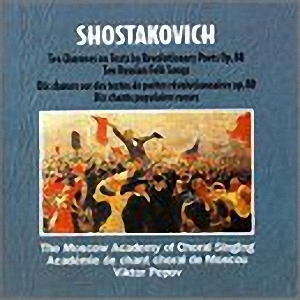 Both works receive beautifully committed, thoroughly idiomatic performances by the accomplished Moscow Academy of Choral Singing, the group founded during World War II by the acclaimed Alexander Sveshnikov, and since 1970 under the very capable leadership of the conductor in this recording, Viktor Popov. The digital sound has exemplary clarity and balance, my only engineering complaint being that a longer pause should have been inserted between the end of the first work and the beginning of the next. Better hurry … given the all-too-transient availability of CDs on the open market, this ideal performance of these rare owls may soon disappear.